It took me three attempts, but I have come up with what I think is the perfect “paleo” chocolate-coconut cookie. No cookie is truly paleo, of course (unless you count dried yak dung), but these little guys are lot friendlier than most. I made these cookies just sweet enough using raw honey and totally grain and gluten-free thanks to the use of almond and coconut flours, which are delicious in combination. Using coconut oil in place of butter adds great flavor and guarantees these cookies come out exceptionally tender. I love how they crackle open on top like classic chocolate crinkle cookies, which were truly my inspiration for this recipe (did your mom make those, too?). Preheat the oven to 350 degrees. In a large bowl, whisk together the coconut oil, honey, cocoa, eggs, and vanilla until well combined. In another small bowl, combine the coconut and almond flours, shredded coconut, baking soda, and salt. Mix thoroughly with your fingers to combine and break up an chunks. Add the dry ingredients to the wet and mix with a wooden spoon until they come together thoroughly. Roll tablespoonfuls of the dough into balls and place onto ungreased cookie sheets. Once all the balls are in place, flatten each cookie slightly with your palm to about a half-inch thickness. Bake the cookies for 8 minutes or until just set and dry looking on top. Remove from the oven and allow the cookies to sit on the pans for just one minute to firm up slightly before transferring to wire racks or a plate to cool. 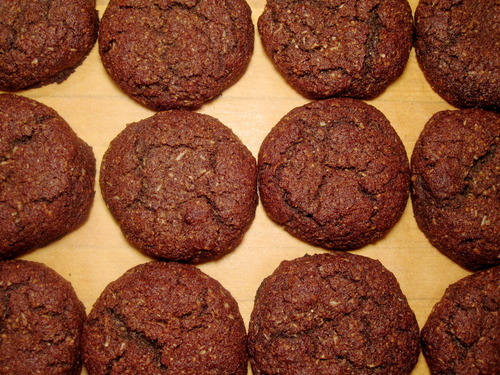 Once fully cooled, store the cookies on the counter for several days or in the fridge for up to 2 weeks. These cookies really do stay incredibly moist! This entry was posted in gluten free, perfect health diet and tagged gluten free, perfect health diet, sweets. Bookmark the permalink.